Carmen Fernandez was born in 1968 in Utrera (province of Seville) and stems from a famous flamenco family, to which also belonged legendary singer Juan Talega. Being the youngest daughter in a gipsy family, she grew up amidst flamenco culture. Her mother a singer, her father a dancer: it is no surprise that soon Carmen too became devoted to the Arte Flamenco. She started off as a dancer, but ended up becoming a singer – always faithfully interpreting the ancient flamenco traditions. Still she succeeds in adding a most personal touch to her music. 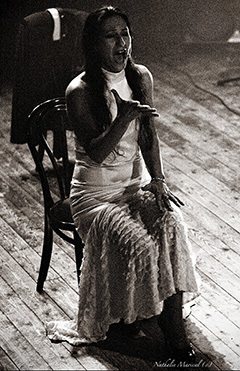 She is a flamenco singer with a sound basis of flamenco knowledge. Her powerful and touching voice made her into the public’s favourite in many a Spanish flamenco peña, as well as on numerous festivals in Germany and the Benelux. She collaborated with Concha Vargas, Joaquin Ruiz and Andres Marin, among others. Discography: her first CD dates back to 2003. Her second and most recent record, called “Natura”, was released in 2005, and her most recent one, "De Corazón", was released in 2015. She figured on many large and famous stages in Europe and Japan, both as a soloist and as a dancing accompanist.